It is no coincidence that Chocó, a region rich in natural resources, has also been one of the focal points of the Colombian conflict, with thousands of people killed or forcibly displaced. Uncontrolled small-scale mechanised mining in Chocó has proved to be a lucrative business for illegal armed groups, helping to fuel the conflict and exploit it. These groups operate in territories belonging to indigenous and Afro-descendant communities, spreading violence and fear, with opponents of the mining threatened, attacked and killed. 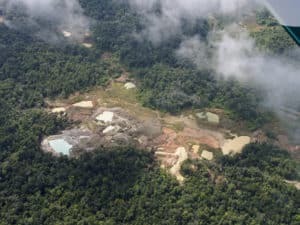 As well as generating violence, these mining operations have serious health and environmental impacts, threatening the lives and livelihoods of the population and damaging large areas of one of the world’s most biodiverse regions.